Liquid Rubber Repair Paint for Hypalon & PVC Inflatable Boats, Qt. 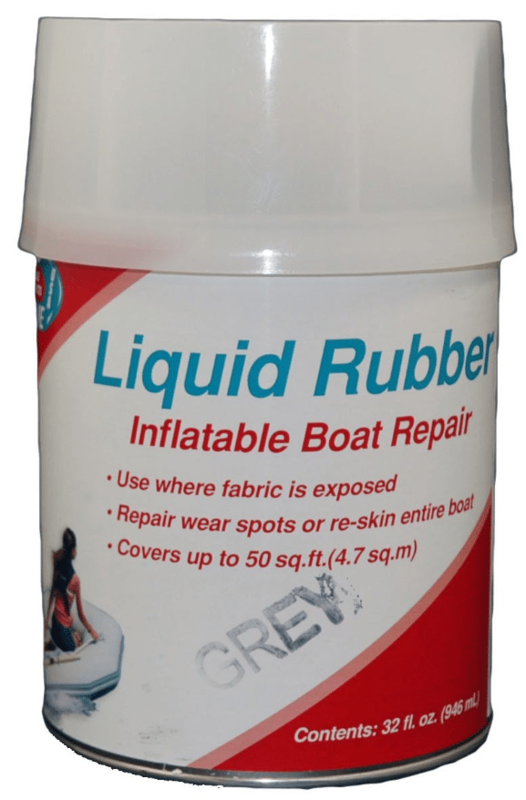 Liquid Rubber Repair Paint for Hypalon & PVC Inflatable Boats, Quart. Liquid Rubber Repair Paint for Hypalon & PVC Inflatables, Quart. Available in White, Black and Gray. Liquid Rubber is the only inflatable boat paint on the market to use pure EPDM rubber in liquid form which is a synthetic rubber used to protect and coat rooftops, playgrounds, and pond liners yet is environmentally safe to be used for those applications. Liquid Rubber is the consistency of honey and “paints” on to form a leak proof membrane of pure rubber. One quart will renew and re-skin a 10′ boat or use it for spot repair by reinforcing those heavy wear spots before they wear through. For porosity, use Liquid Rubber in conjunction with ToobSeal Interior Sealant listed in related products below. Liquid Rubber can be used over and over again. Important Shipping information: Adhesive, MEK, Toluol, Liquid Rubber, and bottom paint is considered regulated material. It can only be shipped via ground transportation.It cannot be shipped via the United States Postal service Priority mail. If you choose Priority Mail as a shipping method, it will be shipped via the United States Postal Service Parcel Select, this service may delay delivery up to 7 days. The fastest method for shipping regulated material is UPS Ground. The boat pictured above was supplied to us by our customer Les Pendleton of New Bern, NC. He said the paint works great but requires a lot of patience as the consistency is quite thick. His 20 year old 10′ Avon RIB looks great!! He did need 2 quarts, however. Thanks for the review, Les! 1. Sand and clean the area to be treated using 60 grit sandpaper or rougher and Bixlir’s Elixir Inflatable Boat Cleaner (in related products below). Do not use citrus based, household cleaners or petroleum based cleaners. 2. Mix the Liquid Rubber with the catalyst provided. If you wish to use only 1/2 the can, mix with only 1/2 the catalyst. The unmixed paint will last indefinetely. Once the paint and catalyst are mixed, the pot life is 6 to 8 hours. 3. Paint on the Liquid Rubber with a brush or roller. 4. Dries to the touch in 24 hours – cures completely in 7 days. Low humid conditions are optimal. Liquid Rubber provides a 4 to 6 mil thick coating of rubber over the existing fabric and rubber on your inflatable and will provide your inflatable with years of new life. For interior sealant, see ToobSeal in related products below. MDR inflatable boat bottom antifouling paint for inflatable boats, dinghies and RIB's. MDR's Inflatable Boat Paint restores inflatables back to their original color and luster from a multi-colored, faded or discolored condition. Available in light gray, gray, white and black. Pettit black bottom antifouling paint for inflatable boats, dinghies and RIB's. 4 oz. 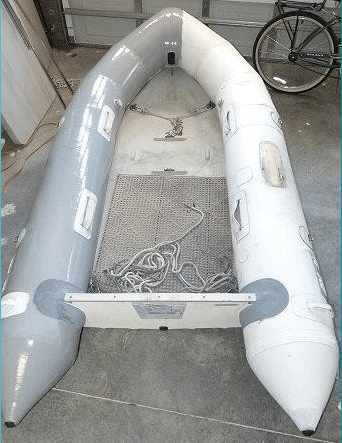 MDR's inflatable boat touch-up paint. Works on both Hypalon and PVC inflatables. Brush in cap for easy, quick touch-up. .
Orange Off Inflatable Boat Cleaner, Adhesive, Bottom Paint and Barnacle Remover, Travel Size 1oz. Orange Off Inflatable Boat Cleaner, Adhesive, Bottom Paint and Barnacle Remover with 6" x 9" scrubbing pad. 1 oz. travel size.